Can you help me take a look on this? The cause and solution of this issue is dependent upon how you are integrated with PayPal this could be caused by one of the following. To resolve this you would need to generate the button and insert it into your email. Than select the button image and click insert > hyperlink in the Outlook programs top menu. In here you can see and remove the space referenced prior to sending the email. 2.) 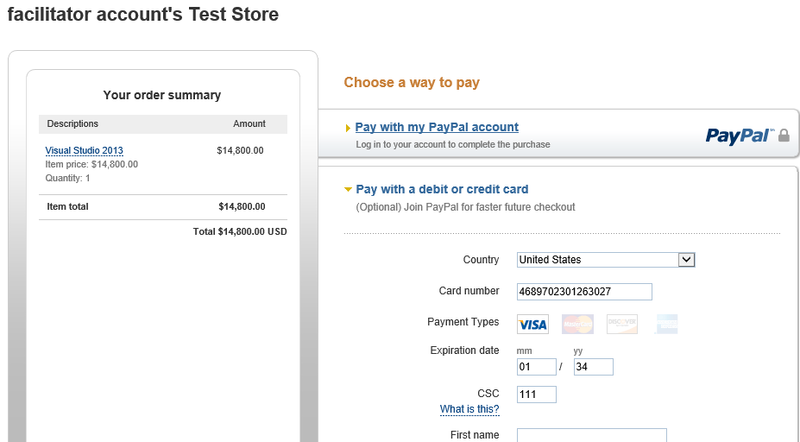 Or If using the PayPal standard buttons it can be caused by the enctype being passes. 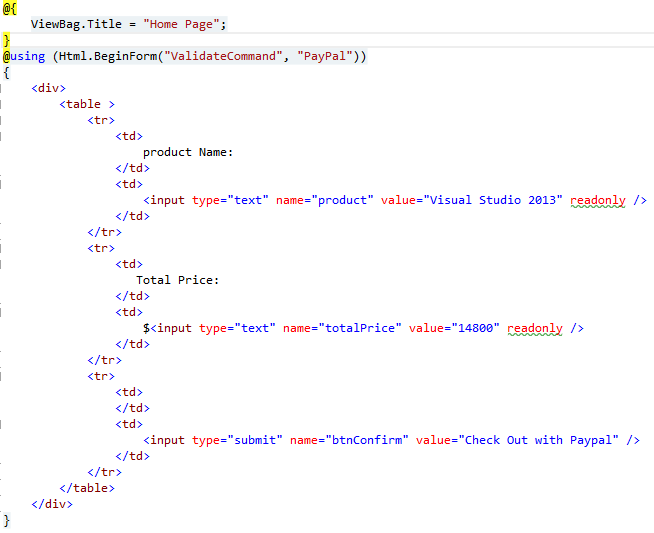 You will want to check your PayPal button code and see if it using an enctype=”multipart/form-data” in the opening FORM tag. 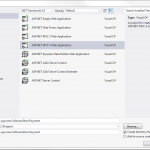 These are the known issues that cause this error. There are other generic coding issues that can cause this error so please let me know if the above does not resolve the issue for you. Also please reply to this ticket with the integration type that you are using so that I may attach this ticket to the escalation in order that you may receive notification when the issue is resolved. It is possible to send you my sample by email. Thanks , Just same wht i am looking for. Here facilitator means the one who receives payment right? can you please let me know what change I need to make in it. 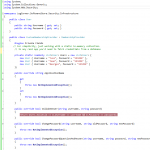 want you the user to pay and logout , and login again to pay by keeping the same profileid ? 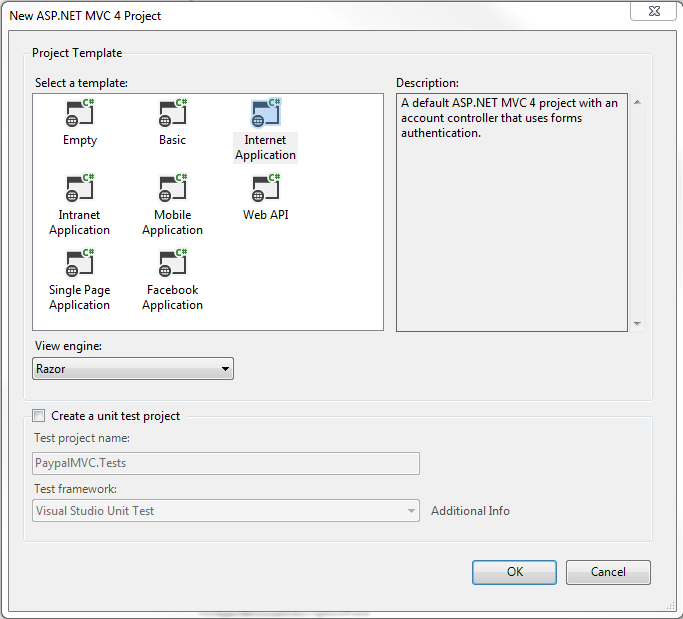 1 °) If yes you can user the user id and pass it in parameters. here you can add parameters you want. 2°) if not you can 1°) or use look for custum membership profile . hope my are helped you. Explain exactly what you want to do ? case 1°) or case 2°) ? I want the payment to occur every month for that user that after he made in the first month. the problem is not a specific PayPal solution but a development solution. You must implément a service that is running and call the payment function each month. 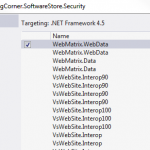 take a look at this tutorial for doing repetitive jobs : http://logcorner.wordpress.com/2013/08/23/using-spring-net-and-quartz-net-job-scheduler/. 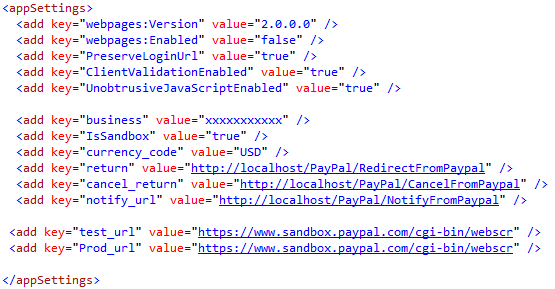 But that we need to store the paypal generareted profile Id for re billing . 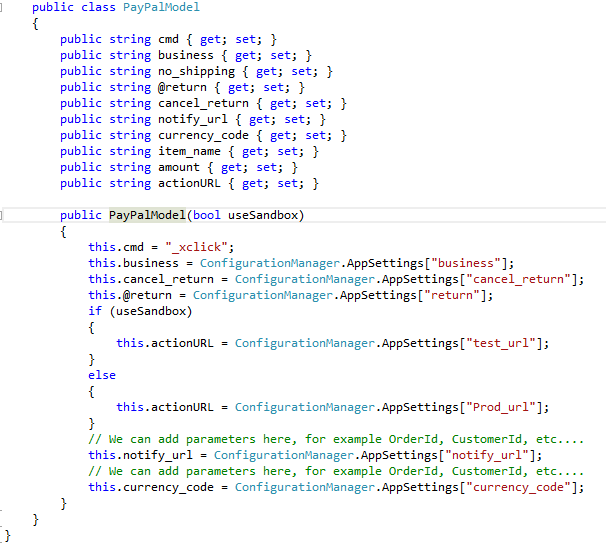 Here, we have SOAP Webservices API hosted by paypal that you can use to perform many operations . 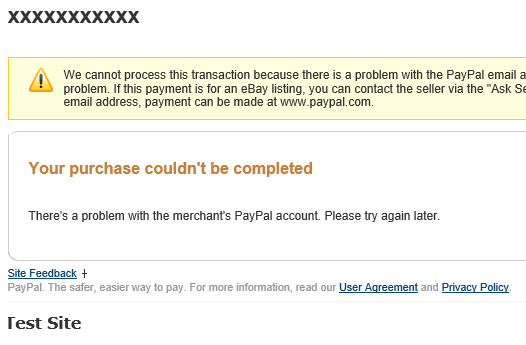 I got the payment_status as pending and transaction Id diffrent from paypal account. can you let me know why this happening? i also face same problem and i also not receive any payment_status when using mobile or ipad why? 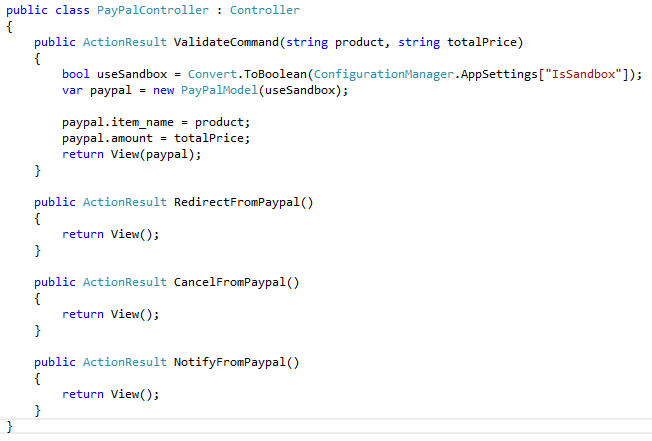 Hi, i have used your code to integrate Paypal in MVC but it received all time paymenet_status pending and i received pending_reason in multiple currency when using Sendbox. 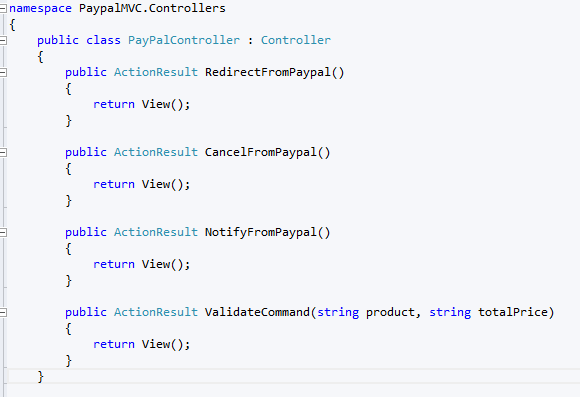 After put code into live and check from Mobile or ipad it doesn’t return payment_Status value, it receive NULL why? please help me. 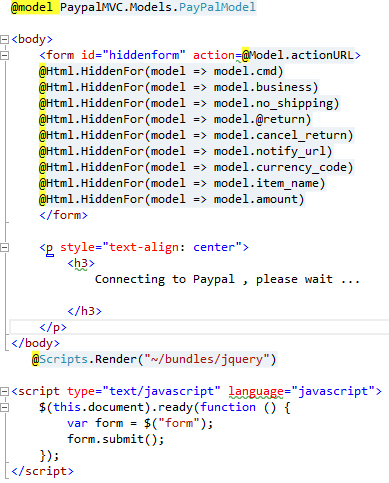 Hi ,,Payment working fine…After the payment,The Paypal redirecting to “http://localhost/PayPal/RedirectFromPaypal”.. But that page was not showing.. It showing 404 error??? Why??? hi , you must have a view whose name is RedirectFromPaypal on PayPal folder or redirect it to an existing specific view. How to make refund request ???? this works perfect, only amount is not deducted from “Personal” account. even “Business” account has credited. Nice post. I learn something new and challenging on websites I stumbleupon on a daily basis. It’s always helpful to read through articles from other writers and practice a little something from other sites. This tutorial is great – but shouldn’t you use IPN verifications just in case the user closes the broswer or the tab and doesn’t get to the target URL on your website after completing the payment? Thank you . Simple and easy way to implement PayPal. The only think I can say is: Thank you, Thank you, I check other tutorials about but one working fine is yours. how to receive message from notify url? Thanks for this article, it’s clear and simple. But, couldn’t it be more secure to check the transaction when the user got back to our website ? 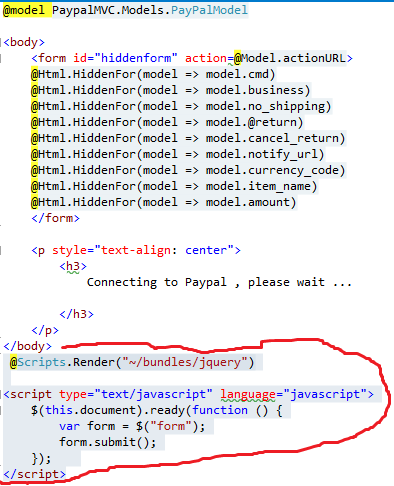 Do Paypal API offer that kind of check ? 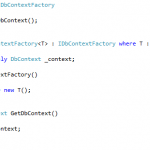 In that way, we can automatically process the user request when he come back to the return url, but he couldn’t try to force this return url. If you already done that check by code, do you have a sample ? any help on how to pass multiple products to paypal checkout please? cartierlovejesduas Im grateful for the blog article.Really thank you! Really Cool. Wonderful, what a webpage it is! This blog gives helpful data to us, keep it up. how to make the return to merchant after the payment in paypal?